Since the last decade, many employers have been trying new work practices and work environments to boost productivity in their organizations. The 21st century is the day and age of entrepreneurship and reforms in the perception of a ‘work environment’. 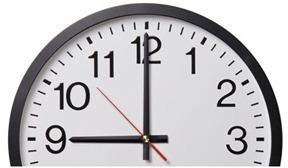 consider abolishing the ‘clocking in’ system in your office. Are there people at your workplace who consider themselves to be at their productive peak during certain times of the day? Often you may hear lines like "Oh, I’m not a morning person". Giving the option of flexible work hours in the workplace to such people may boost their productivity if they are allowed to work during their hours of peak productivity. We’re sure that employees in any workplace will be happy to welcome flexible work hours. They can run errands, attend to the needs of family or tend to other priorities in life while adjusting their work schedules. Flexibility in any employee’s mental approach to his or her environment will add to the morale and attitude towards their work. The employee will appreciate the organization’s concern towards him / her. This benefit of having flexible work hours applies to the people who live in suburbs that are far away from their offices. For such people, a 90 minute drive during peak hour may be reduced to a half an hour drive during the non-peak hour. If beating the traffic makes a world of a difference to you or your employees, you should definitely think of having flexible work hours. A burnout refers to a state of mind full of frustration or other emotional and physical elements which cause a drag in your work and personal life. A burnout may cause an employee to quit his job or a manager to unnecessarily vent his or her frustration on their subordinates. Flexible work hours may be able to address this situation by allowing people to take some time off on a day when everything seems to go wrong and cover up the next day. We think it is safe to understand that employees who work during hours that are favorable to their own personal schedule will be less likely to indulge into deliberate absenteeism from work, don’t you? Flexible work hours give employees that little bit of control over their work-life balance. This will dictate whether they see their jobs as a chore to be done or with a ‘look-forward-to-work-today’ approach. Is stretching your opening and closing time beneficial for your organization? Will it make more business sense to have your customer service department open till late rather than close off at 6 pm? This can be achieved without hiring extra personnel by having flexible work hours in your organization. Instead of having all the people clock in and out in the usual 9 to 5 schedule, why don’t you try flexible work hours and stretch your closing time till 8 pm? You could ask some of the employees to come in a bit later. Are you missing out on hiring someone skilled and talented simply because he/she cannot work during the regular timings of your workplace? If you are, flexible work hours may be the way to go for you to accommodate for skilled workforce who you may miss out on if you did not. Let’s take a look at a classic example to elaborate on this advantage of having flexible hours at your workplace. What will you do if a female subordinate who has been working in your organization since the last 6 years drops in her resignation because she is soon to be a mother? Would you rather go through the hassle of recruiting a new employee and train them for the next one year, or would you prefer to give your current employee some time off and have her back on a flexible schedule? Hiring and training a new employee is any day more expensive and troublesome than retaining one. So if flexible work hours in your workspace are making things work for you, why not? As you can see, flexible work hours have many advantages both for the employer and the employee. Having said that it might be possible that some organization may face challenges and practical road blocks when it comes to actually implementing flexible work hours in practice.